Ecstasy—the street name of the chemical 3,4-Methylenedioxymethamphetamine, shortened as MDMA—is a synthetic, psychoactive (mind-altering) drug with hallucinogenic and amphetamine-like properties. Its chemical structure is similar to two other synthetic drugs, DA, and methamphetamine, which are known to cause brain damage. Ecstasy is also known as Molly, Adam, Xtc, X, Hug, Go, Hug Drug, Beans, and Love Drug. Ecstasy was originally developed as a diet aid but was also used experimentally during counseling because of its ability to remove an individual's inhibitions. Although some clandestine labs have been discovered operating inside the United States, most of the MDMA sold in the U.S. is manufactured in Canada and smuggled into the U.S. A small percentage of Ecstasy in the U.S. is manufactured in the Netherlands. Ecstasy comes in a tablet form that is often imprinted with graphic designs or commercial logos. It is usually swallowed as a pill but it can also be crushed and snorted, injected, or used in suppository form. 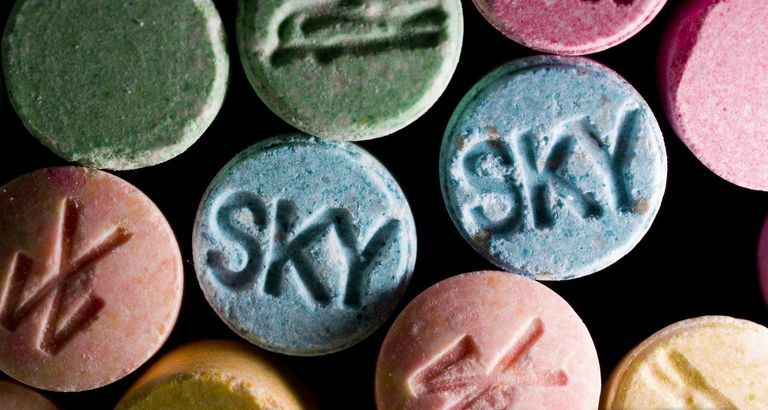 Ecstasy is popular among middle-class adolescents and young adults. It is sold at bars, underground nightclubs, and at raves, which are all-night parties. It is known for its energizing effect, as well as distortions in time and perception and enhanced enjoyment from physical experiences. The effect, per use, lasts from three to four hours. Its popularity grew in the late 1980s in the rave and club scenes and on college campuses because of its reputation for producing high energy and a trusting and opened effect among those who take it. These medical consequences can be serious and potentially life-threatening. The physical side effects that occur while taking it can last for weeks. Users often experience muscle tension, involuntary teeth-clenching, nausea, blurred vision, rapid eye movement, faintness, and chills or sweating. MDMA is very dangerous if you live with circulatory or heart disease because the drug increases heart rate and blood pressure. Almost 60 percent of people who use MDMA report withdrawal symptoms, including fatigue, loss of appetite, depressed feelings, and trouble concentrating. Some users may require treatment for drug abuse. Combining or using drugs with MDMA, including marijuana and alcohol, is dangerous and will put users at higher physical risk. In a study using monkeys, exposure to Ecstasy for four days caused brain damage to serotonin nerve terminals that could still be seen up to seven years later, providing evidence that people who take Ecstasy may be risking permanent brain damage. Research has shown that MDMA can damage serotonin-containing neurons, which may lead to long-lasting mood changes as well as potentially affecting attention, memory, and other cognitive functions. The parent drug to Ecstasy is MDA, an amphetamine-like drug that has a similar chemical structure to MDMA. PMA (paramethoxyamphetamine, associated with fatalities in the U.S. and Australia) is also sometimes sold as MDMA. National Institute on Drug Abuse. "MDMA (Ecstasy/Molly)." September 2013.